The Betlem Club Hotel is located in Prague 1 in the center of the Old Town. With Old Town Square and the Charles Bridge only a 5 minute walk away, the hotel is also very close to Wenceslas Square, the Jewish Quarter, the Royal Way, the National Theater and many other landmarks of Prague 1. 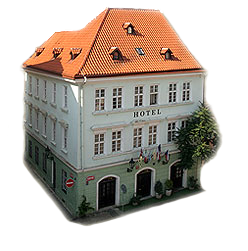 Whether you come to Prague for the sights, the shopping, the culture, the romance or just for the fun, Prague 1 is an ideal place to choose for your accommodations because you are right in the center of the action. Prague 1 is located in the center of Prague and was formed by the Old Town, the Jewish Quarter - Josefov, a large part of the Hradcany, Lesser Town and the New Town, and a small part of the Vinohrady and Holešovice. Prague 1 is situated on both banks of the Vltava River and includes most of the medieval heart of the city, making up a significant part of the historical center of Prague and has one of the world's most interesting cultural heritages. Prague 1 is located close to all the major attractions like Prague Castle, Old Town Square, the Charles Bridge, the National Theater, or the Jewish Quarter. The Parliament and the Government of the Czech Republic is located in the Lesser Town (called Malá Strana in Czech). Even Charles University is largely located in the Old Town of Prague. Real estate in Prague 1 is among the most expensive and prestigious in the city.